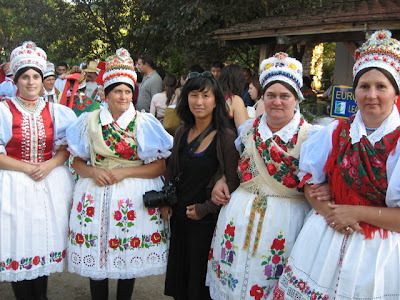 Kapolcs, a sleepy little west Hungarian village north of Lake Balaton, is the annual host to a festival called "the Valley of Artists." 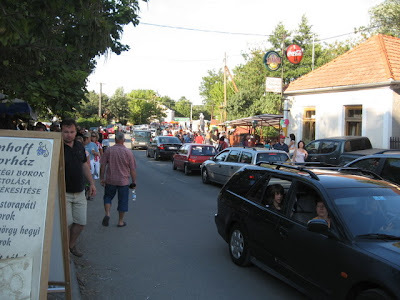 For a week, this normally sleepy village is turned into a sort of Magyar Alternativo event in which people trek around the village to visit impromptu gallery shows set up in local folk's barns and wine cellars. The even has grown so huge that it has expanded to include six of the neighboring villages, and on the weekends it is one huge, slow traffic jam. During the day there are theater performances and presentations featuring artists talking about their work (imagine that!) but by and large, it was basically a huge crowd wandering around looking at stalls selling neo-hippy crafts and clothing. You know, hemp dresses, natural wax candles, knit rasta hats, insense. 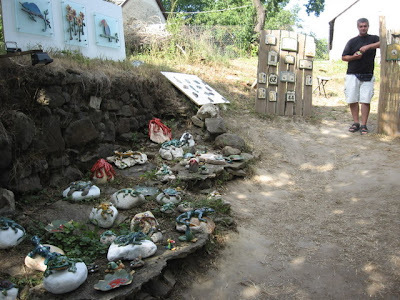 As concerns art, well, I wouldn't write it with a capital A ... how about ceramic red octopus and frog sculptures? As Fumie pointed out, Hungarians love to go to events that attract crowds. the mere fact that nothing focused or organized is really happening at these events is irrelevant to the fact that Hungarians love wandering around looking at crafts stalls and then stopping for a beer and a nice big kolbász. Usually it is very bad kolbász... but this is the countryside and the sausage is local and somebody actually cares about quality out here. Fahren Sie nach Bad Kolbasz heute? I am not a big fan of Hungarian festival food, but outside of Budapest you can get lucky and come upon some real local food unhindered by some cheap Budapest trained chef making sure you don't add too much meat to the gulyás soup. You really can not find a decent gulyás leves in Budapest, but as soon as you leave the city you are pretty well guaranteed a fine bowl of red meat soup. 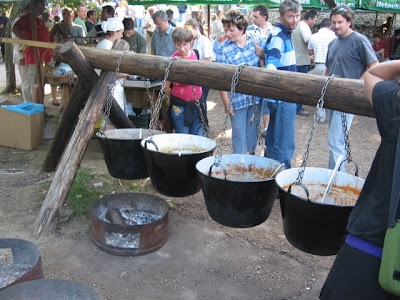 Traditionally gulyás was cooked oudoors in a huge cauldron called a bogrács by cattle herders and shepherds on the plain. 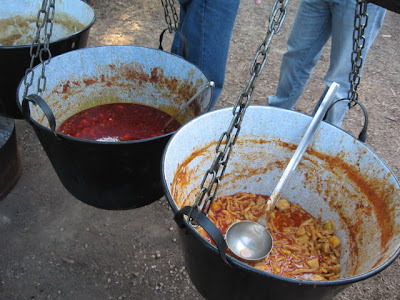 All you needed to store in your shepherd's pantry was a bag of salt, a bag of paprika, and maybe a few kilos of potatoes, and all you needed was to cull a steer now and then and you had gulyás soup. Although paprika is the ultimate symbol of Hungarian cooking, the truth is that it was not much used before 1800. 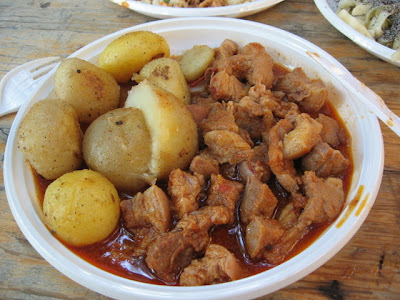 As Hungary's national self-awakening strengthened in the second half of the 19th century, peasant dishes such as gulyás became gastronomic statements of independant, pro-Hungarian sentiment in the inns and chow houses of Budapest and other Hungarian towns, eventually becoming the basis for a paprika-laced haute cuisine championed by chefs like Karoly Gundel. Above is a beef gulyás on the left, with a tripe stew at right. Tripe - pacal - is one of my favorite foods. I love Turkish tripe soups, grilled tripe, chewy african tripe stews, but I can't stand the smell of tripe paprikás. For some reason tripe seems to react chemically with paprika to create the most foul smelling, repulsive, and downright yuckiest edible substance on the planet. But that's just my opinion. Hungarians love it stewed in paprika. They also eat a lot of carp, which is a fish I'd rather not even think about - The Pig That Swims. Ahhhh.... lunch! Pig knuckle stew with roast potatoes. I will admit this: I ate it. In fact, I ate it on a Saturday. Did I, as an openly identified Jew working as a Klezmer musician, promoting Yiddish culture in the heart of Eastern Europe, feel any slight pangs of hebraic remorse for eating Porky Pigowitz on shabbos? Nope. None at all. It tasted good, I was hungry... and now I am not. 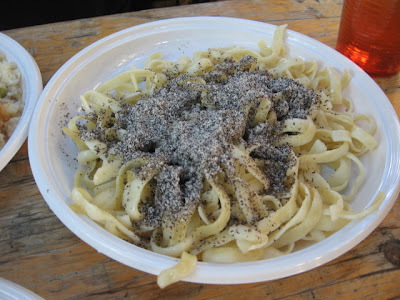 Here is one for the radical, perverse pasta experimentation crowd - tradtional Hungarian mákos tészta, noodles served with crushed poppy seed and granulated sugar. Sounds strange, tastes great. It's the Dirt Dessert! When Primo Levi, the Italian Jewish writer, was released from Auschwitz, he and his fellow Italian Jewish companions were held in a refugee camp run by Russians before being released to return home. Levi wrote of the utter repulsion of the Italians at the Hungarian Jewish cooks in the camp, who served sugared poppy seed noodles almost daily. 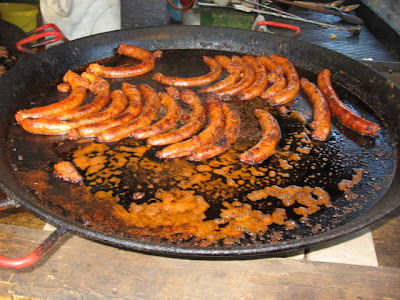 Which makes sense, since it is dirt cheap, easy to prepare, and, best of all, about the only dish in Hungarian cuisine that is always absolutely kosher. The House of Hungarian Fruit Brandies... representing! Ever since Hungary gained entrance to the EU the rules regarding the sale of pálinka - homebrewed brandies - have finally stabilized so that small scale producers can enter the market, and now we have a lot more choice than the nasty aroma-flavored old communist factory pálinka that once cornered the market. 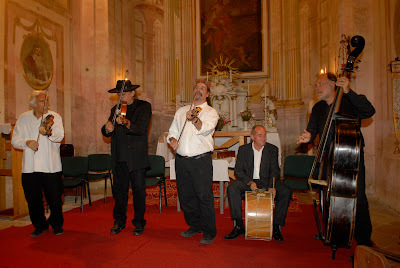 The reason I was in Kapolcs was to do a gig with Muzsikás at the small Catholic Church. 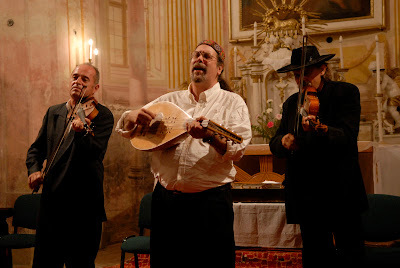 Playing Maramures Jewish music togther with the Muzsikás band is pretty much the apex of my career as a fiddler. I grew up listening to their early recordings, and spent hours every day trying to figure out the fiddle parts of Transylvanian Hungarian music that seemed so foreign to a fiddler trained in Appalachian and Old Time American fiddle music. Mihály Sipos has always been one of my favorite fiddlers, with a great sense of style and repetoire choice that make him unique among virtually all the other musicians in the Dance House scene. 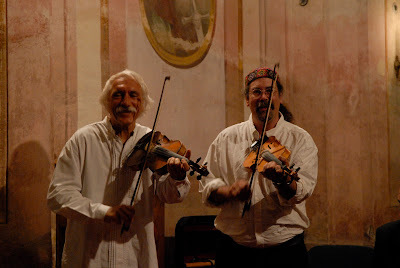 To be performing with the band that inspired me to learn Hungarian folk fiddling to begin with is a great feeling, a dream come true for a modest folk fiddler like myself. Oh, and and I played a bit of cobza/koboz too. Twenty years of practice makes perfect! Thank you for documenting this event so well in both words and photos.